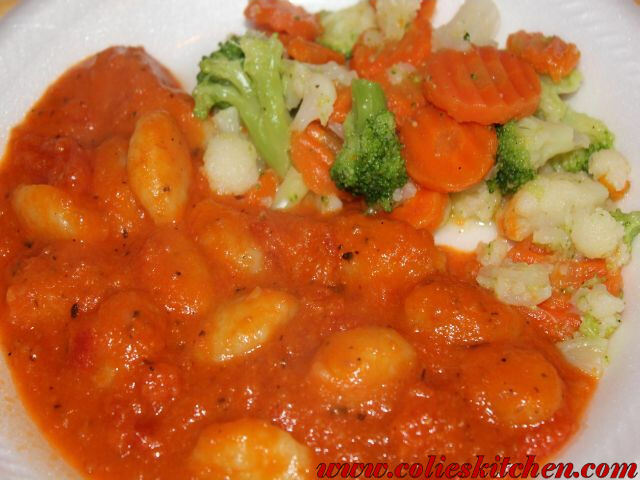 I had never had gnocchi before, but I have heard so many great things about it that I wanted to try it. I was at World Market a few weeks ago and came across it so I decided to pick up a bag. I honestly didn’t know what to expect. I knew gnocchi was potato pasta so to speak, but I wasn’t sure if I would like it. I thought it was really great and I thought this recipe was excellent. The only thing I would do differently next time is I would go low salt everything. Low salt broth and I would not add salt to the gnocchi while it’s cooking. In the end everything was just extremely salty to all of us. Other than cutting out as much salt as possible this recipe is a true winner and something I look forward to making again in the future. I have no idea if it’s even close to Olive Garden’s Recipe but its great regardless! Place the olive oil, garlic and chili flakes in a cold pan. On medium heat, stir and cook the olive oil, garlic, chili flakes until garlic turns slight golden brown. To this mixture, add the white wine and chicken broth. Simmer about 10 minutes. Reduce the wine and broth by half, add the tomatoes and basil, and continue to simmer for 30 minutes. Puree the sauce in blender with the butter and Parmesan cheese. Season to taste with salt and pepper. Prepare pasta when sauce is complete. Use a large pot to boil pasta. Cook the pasta in salted boiling water until they float (approximately 3 minutes or 160 degrees F internal temperature). Remove pasta from boiling water and lightly mix with sauce. Top with Mozzarella cheese if desired.